Please see individual varieties for specific product information, but in general the growing information will be the same for all eggplant. The majority of the information on this page was provided by the University of Arkansas Cooperative Extension Service Eggplant Home Gardening Series; download the complete pdf file with FAQ’s for more information or click here to visit the website. When To Plant: Eggplant should be planted after all danger of frost has passed when the weather is warm. The earliest Charley recommends that you plant your cantaloupes is late April or early May about at the same time you plant your peppers. Planting Tip: Eggplant do well in hot weather but do not thrive in humid areas. Cover eggplants in cool weather to protect them. Average Yield: 20 pounds per 10 foot row. Preparation and Care: Eggplants need well-drained, fertile soil with ample moisture. Use a 10-20-10 starter fertilizer incorporated into the soil prior to transplanting. Eggplants do best when started from transplants when the weather has warmed to at lease 70 degrees F and need warm to hot weather all season for good production. Fertilize: Eggplants are heavy feeders. Side-dress the rows with the Charley Method of one handful of 10-20-10 fertilizer per 2-3 feet of row after the first harvest and repeat every 3-4 weeks after that. Harvesting: Pick eggplant when immature, about 2/3 maximum size. Fruit should be large, shiny and uniform in color. 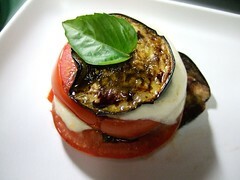 Press the side lightly with your thumbnail and if an indentation remains, the eggplant is ripe. Louisiana Green and Japanese (long slender eggplant types) can be ready to harvest when they are about 3-5” long. Mature eggplants left on the plants should be picked and discarded to keep the plants producing eggplants. 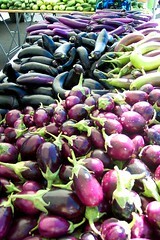 If the eggplants have a dull color and brown seeds, it is over ripe and should be discarded. Eggplants are very sensitive to frost, and do not grow well in cold, wet soils. Cold weather will stop plant growth and reduce yields. Good gardening practices such as crop rotation, drip irrigation, proper planting time, floating row covers and removal of entire plants when harvest is done all help prevent many pests and diseases. This lace bug feeds on eggplant primarily but is also occasionally found on other members of the Solanaceae family – tomato, potato, etc. It is dark brown around the head and has lacey, well-veined wings. Adults feed on leaf undersides. There are numerous over-lapping generations each summer. Yellows – Tobacco mosaic virus appears as yellow, mottled, deformed leaves. There is no cure. Remove and destroy infected plants.